As promised there is some wonderful JustRite blog candy today! But first let me show you a couple of tags and a fun card I made using the JustRite “Sonnet Stamper-10 Designer Centers and Borders” Set. The card also uses Flourishes newly released set “Sleigh Ride”. The lush gift boxes are spruced up a little more with tags and some May Arts ribbon. 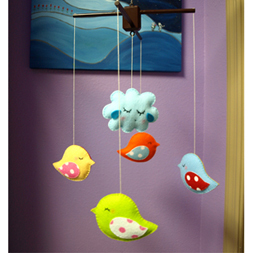 Aren’t these tree ornaments cute! Okay enough teasing. Let’s get on with the blog candy!!! Flourishes is kicking off the holiday season and everything at Flourishes is JustRite!! 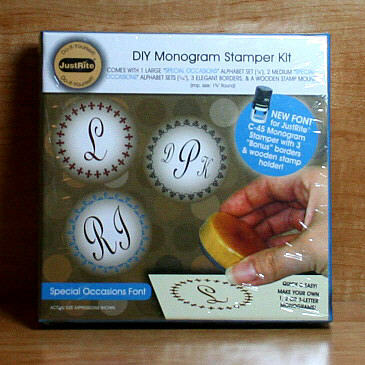 They want to make it easy for you to add to your wish list or buy for that special stamping buddy in your life. 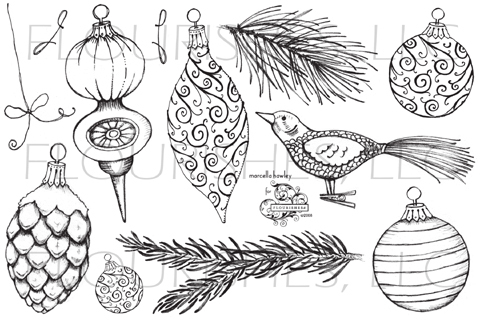 So starting December 1st, everything JustRite in the Flourishes store will be 25% off!! The Flourishes Design Team will be showing you lots of fun ways you can use these products, and we are giving away some goodies of our own!! Besides myself, Faith Hofrichter (Markie’s Mom) is also having some JustRite candy today. Be sure to check the Flourishes Newsletter for the Winner’s Roundup List on Sunday, November 30th. TO ENTER: Just leave a comment here on THIS post. The contest will close on Friday, November 28th at midnight PST. I will use random.org to pick the winners. #1 on the list will be given their choice of any of the 4 packages. 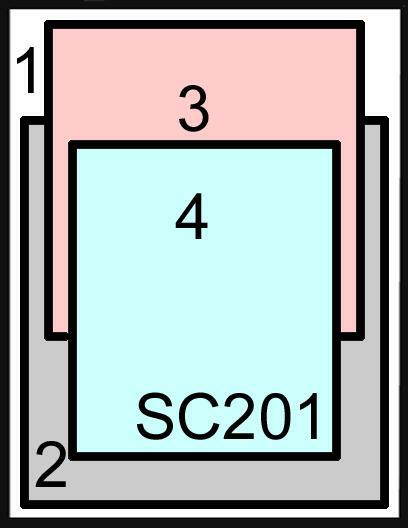 #2 on the list will be given their choice of any of the remaining 3 packages and so on. The winners will also be announced here on Saturday, November 29th. Many thanks to Flourishes for making this possible!! Good luck everyone!! My teenage son’s cross country team has had a great season. The team mom has been really great, too. There have been so many trips with some involving airline flights and hotel rooms and dinners and rental cars, etc. etc… So many details and she has kept us all organized. This card is for her. I tried to make it look like many of the courses that our racers have been running lately. The stamps are from Flourishes “Forest of Trees” set. I will have 4 separate JUSTRITE packages to give away!! To get a sneak peek at them check out Leslie Miller’s post here!!! Thanks so much for stopping by. Have a wonderful weekend. Splitcoaststampers SC203 - "Autumn Flourishes"
This card is for the Splitcoaststampers Sketch Challenge #203. 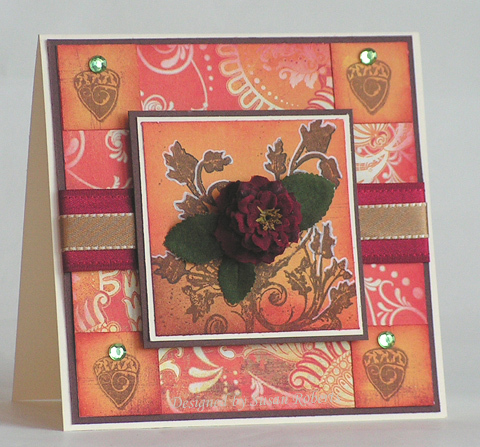 The stamps used are from Flourishes new release “Autumn Flourishes”. I used Basic Grey’s “Ambrosia” designer paper for everything but the borders and card base. The edges have been sponged with Ruby Red and Chocolate Chip. A white and a black gel pen were used to outline some of the leaves on the main image. Both ribbons are by May Arts. The rhinestones are by Kaiser. Okay I really must do some laundry. My 17 year old came to me last night as he was going to bed and asked if I could transfer the clothes that he just put in the washing machine into the dryer. I’m a terrible mother. Piles of laundry still sit from our trip to Boise, Idaho, this past weekend. His X-Country team was running in the Nike Regionals there. The girls had taken 1st place in Washington State. They took 2nd at Regionals so now qualify for Nationals in Portland, Oregon, on Dec 4th. Exciting stuff… but oh the laundry. Yes, I must get to that. Oh one other thing though… I got a call from one of my married sons last night. They are expecting their first baby in January. Looks like this little granddaughter may be coming early. Kimberly is now on bed rest. Having lots of contractions. She is a very tiny lady and an early delivery was expected. But we are hoping she can hang on for another 2 or 3 weeks. They just (as in the final paper work gets done TODAY) bought a home. Looks like Jeff will be doing all the moving on his own next week. Wonder if he needs a mom to show up and help move the kitchen. Maybe I can do their laundry!! I’m so good at that! LOL!!! “Autumn Flourishes” is a beautiful silhouetted set filled with graceful images. It is one of three of the newly released Flourishes’ sets this week. On this card one of the large images is used as the focal point. The sentiment is also part of this gorgeous set. I had completely forgotten about my Spectrum ink pad. But when I saw these cards by Leslie Miller, I was reminded of it and knew that I would just have to try it with this lovely leafy autumn set. Check out the other Flourishes’ designers to see what wonderful creations they have made with Flourishes’ newly released sets. 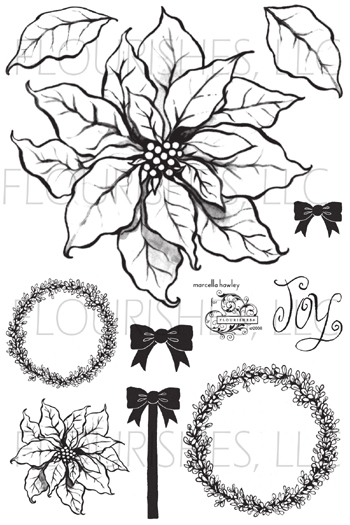 Here are the 3 new sets released by Flourishes this week! Besides offering a 10% discount on the new release bundle when you purchase all 3 sets, Flourishes is also having a terrific sale on ALL BASIC GREY PAPER and BRADS. Oh and there is so much more on sale including some of the most popular JUSTRITE ENSEMBLES. Check it all out over on the Flourishes’ Blog! Flourishes' Release "You Are Invited"
Sometimes clean and simple are just the ticket especially for those cards or invitations where you need to make several of them. 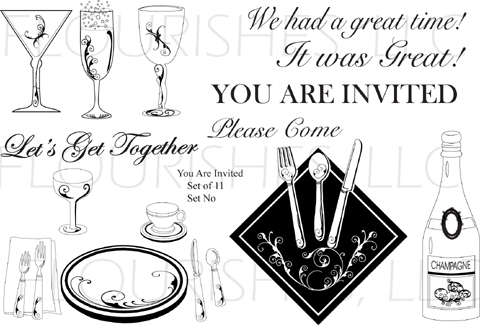 Well Flourishes’ new “You Are Invited” set makes it easy! 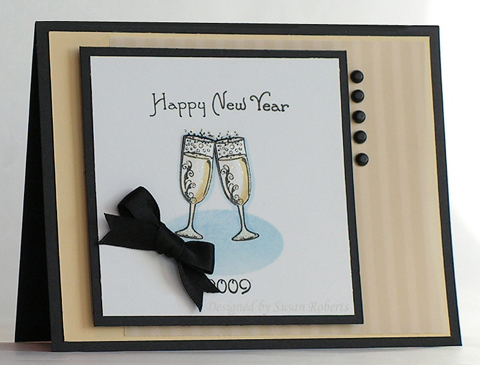 This card came together SO quickly, and I just love it’s black tie feel. For the oval shading, I punched an oval with SU!’s oval punch and then sponged using the reverse mask. 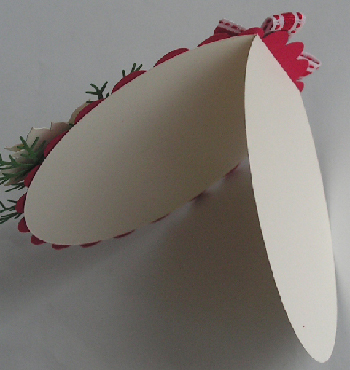 I got the idea to use an oval from this darling card by Jennifer Alcivar. 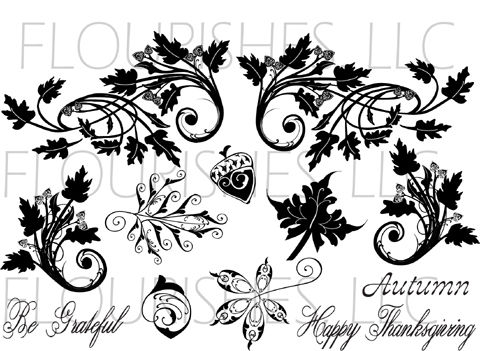 The sentiment is from Flourishes “Holiday Greetings” set which was released last month. 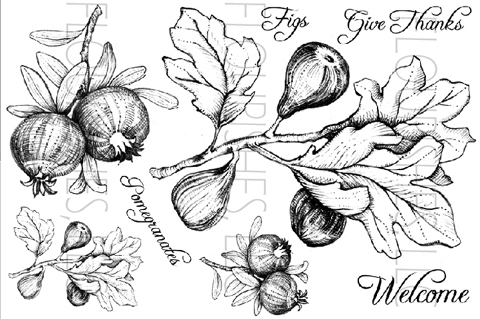 Flourishes' Release "Figs and Pomegranates"
Flourishes is releasing 3 new sets today! I am so excited to show them to you. They are beautiful! Today’s card uses the set “Figs and Pomegranates”. The sentiment is from “Autumn Flourishes”. The deeply shaded areas and well defined lines on this image make it a breeze to color. Practically everything is done for you! I used reinkers to add a little color and voila! 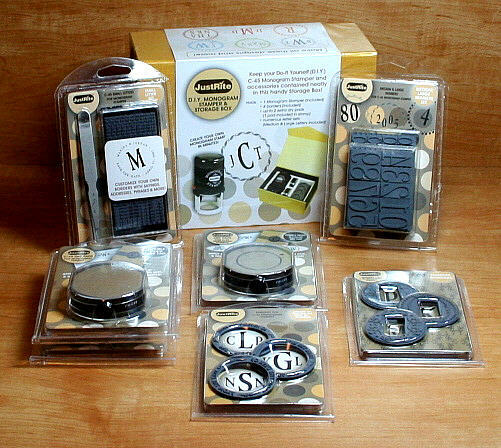 Check out the other Flourishes’ designers to see what wonderful creations they have made with these new sets. Besides offering a 10% discount on the new release bundle, Flourishes is also having a terrific sale on ALL BASIC GREY PAPER and BRADS. Oh and there is so much more on sale including some of the most popular JUSTRITE ENSEMBLES. Check it all out over on the Flourishes’ Blog! Isn’t this a great sketch?! 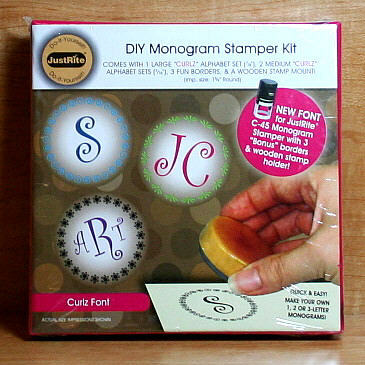 It is the layout for Splitcoaststampers sketch challenge today. I just had to play along. I pulled out a couple of Flourishes October releases and made this card. I photographed this at night and I don’t have a light box. So admittedly it is quite dark. The reindeer is from Flourishes “Sleigh Ride” set and the sentiment is from their “Holiday Greetings” set. 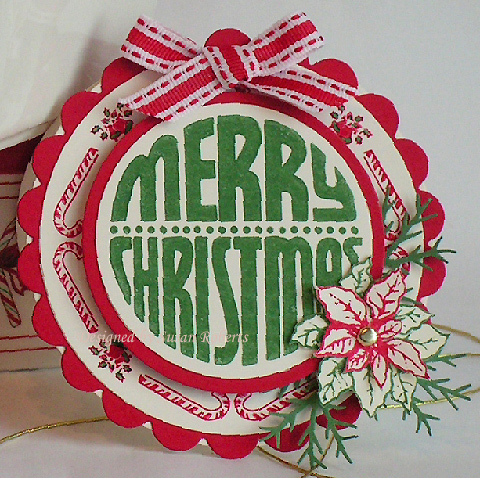 I love the “Glittering Christmas” designer paper also from Flourishes. 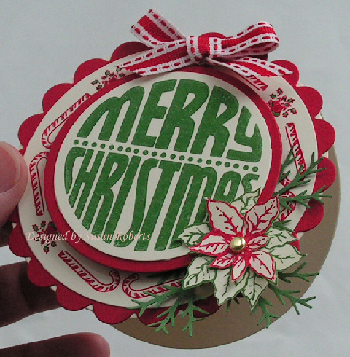 Using my Cuttlebug and Spellbinders oval die cut I embossed the largest oval on the white card stock. It isn’t showing very well in the picture. I had to choose between the embossing or the sparkle as the lighting wasn’t right to show both at once. I chose the sparkle! lol The red organdy ribbon is May Arts. Since I first saw the pine bough image from Flourishes “All That Glitters” stamp set, the idea for this card has been in my head. And I have to admit I love the serene and peaceful feel of this scene. I stamped the bough image several times, starting at the bottom and moving up, to form the large half tree in the foreground. 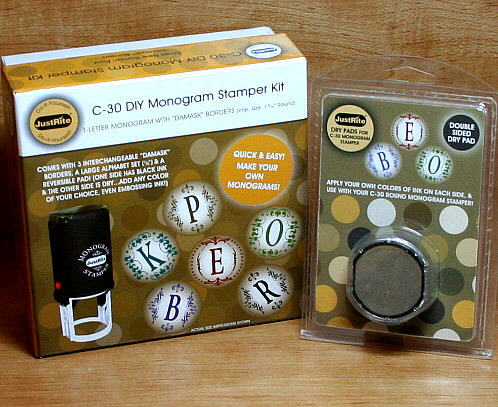 The tree in the background is from Flourishes “Forest of Trees” stamp set. 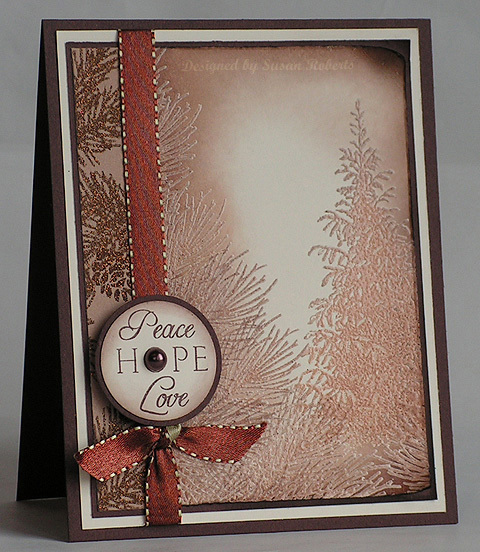 Using the emboss resist technique, both trees are stamped with a blend of Creamy Caramel and VersaMark and then embossed with clear embossing powder. SU!’s Creamy Caramel, Close to Cocoa and Chocolate Chip inks are then sponged onto the card stock. The left panel is Flourishes “Glittering Christmas” designer paper. 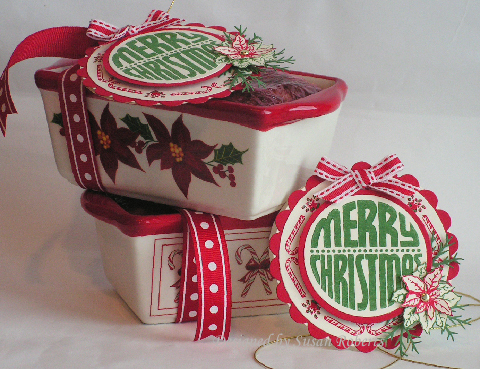 The sentiment is from Flourishes “Holiday Greetings” stamp set and stamped in Chocolate Chip. There is a chocolate Kaiser flatback pearl placed on the sentiment. The ribbon is May Arts. It’s Halloween and each year there have been fewer and fewer trick-or-treaters at my door. I miss seeing all the little ones… *sigh* Last year I bought full size candy bars in the hopes that the word would get around that the walk up our driveway was worth it. But I only got seven total. Well ever the optimist, I’m still hoping I get tons of spooks and goblins tonight! lol Have a safe and happy one! I just couldn’t resist these darling baking dishes while shopping the other day. And well of course I had to make a couple of tags to go with them! So using my JustRite Christmas Stamp Ensemble and my Flourishes Poinsettia and Boxwood set, I did just that and made some matching tags. Doesn’t that pretty little poinsettia make a perfect accent! The circles were all cut using the Classic Circle Nestabilities. The center sentiment was popped up on dimensionals. The holly and bells on the border were colored in with markers. 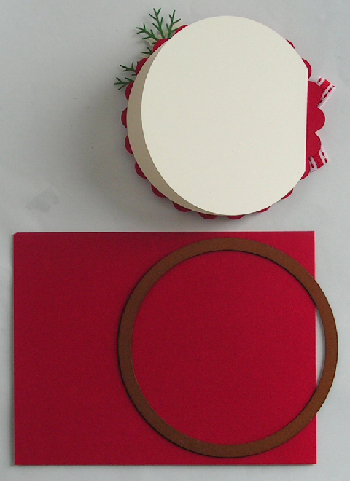 I also used my Nestabilities to cut the round card base. And now that I’ve photographed this I can slice up and eat the bread! Well it’s actually sort of a fruit cake. So confession time… I like fruit cake! Yay, I think I’m in the minority there! Well all the more for me! hehe I do plan on giving these as gifts, but before I do I will fill them with something that tends to be more universally popular like banana bread!